I spent the holiday weekend teaching on the river and several experiences made me reflect a little bit on the nature of whitewater kayaking. The simple truth is that it is not an easy sport. There is so much going against this sport that is it kind of surprising that anyone does it. You have all this gear to acquire, you lock yourself into a tiny boat which doesn't go where you want it to, you flip upside down in cold water, your natural instincts are almost always detrimental, you have to learn complicated body movements while balancing a boat and figuring out water dynamics all at the same time, and that is all before you even get to actual white water. But once you get to that whitewater - that's what hooks people. 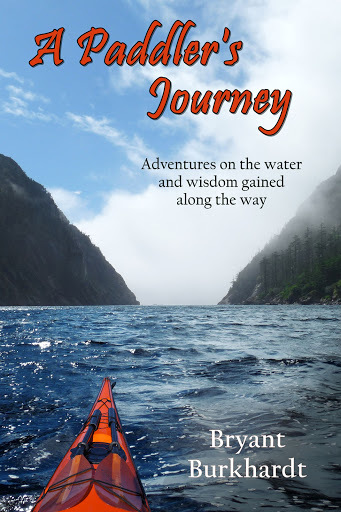 The power of the river, the sense of controlling your destiny while being out of control, the shear exhilaration of it all, that is why people climb that steep learning curve. And maybe that is what connects us as paddlers. We have that shared struggle, that same past of facing the unknown and conquering ourselves in the process. We are eager to share with each other and eager to help others on their journey. Every special society has to have its initiation and whitewater kayaking has the same one for every wannabe member - the river itself. I'm attending a wedding of a paddling buddy today. While I know from past experience that it means he won't be paddling as much anymore, I'm OK with that. My life may center around paddling but many times I think that it is probably not the best way for most people to live. We need folks doing real things to create the rest of the stuff I also enjoy in life. My buddy Rob, for instance, helps to make sure satellites stay in orbit which is important in some way I'm sure. I'm happy for him because he is happy with his choices and I don't resent the fact that I'll lose another paddling partner. Luckily there are always folks to go paddling with. Of course I'm not going to pass up the chance to use Rob's wedding as an excuse to get some paddling in while down in SoCal. On Friday I went out kayak surfing in Palos Verdes with Rob and his best m an Phil. Small waves but still a fun day. Yesterday I headed up to the Kern to get in a little whitewater. I got to take Giselle down Ant Canyon for the first time and it's always fun to see someone get smacked around by the big water feel of that stretch but to keep rolling up with a smile. I even talked her into running the sneak on Lower Salmon Falls which really turns the day into an adventure - and that is, after all, the best part about kayaking. 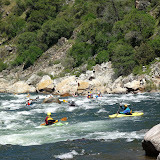 The Reno River Festival is really like no other paddling festival. The truth is that it is a Reno Festival that happens at the river. While there are the usual river festival events - freestyle, downriver, boatercross - these events seem like mere entertainments to the thousands of passersby who wander through the park. Most visitors have never been kayaking, may not even know what kayaking is, but they enjoy the antics of the silly folks in the brightly colored boats. As such the atmosphere is a little different than say the Kern Festival. It seems to be more about selling things and less about hanging out with everyone. I helped to set up the CCK booth on Friday and we sold far more hats and Hawaiian shirts than PFD's or paddles. Our used boats got many curious lookieloos who have no intention of ever putting a blade into the water. But the way to make it enjoyable is to hang out with the folks you do you and try to avoid the Reno madness (unless you're into that sort of thing in which case I know several folks who had a great time and late nights). I was teaching the free clinics over the weekend so spent my days with my fellow CCK instructors on and off the water. We did four 1.5 hour clinics each day and it made for a crazy frenzy of getting folks into boats and on the water with enough time left to fly through some instruction before getting back to get ready for the next class. We did a Freestyle clinic, beginner, intermediate and advanced. Luckily we had a rotation so some folks were teaching while the others were taking sign ups and sorting gear. It was all the usual controlled chaos but ended up quite well with many very happy students. In the majors the difference between a good pitcher and a great pitcher is that the great ones win even when they don't have their best stuff. Some days the fast ball just doesn't have that pop to it or the curve just isn't cutting as sharply. When that happens it is the mental focus and perseverance that wins the game. That is how I feel about yesterday's 49 to Bridgeport run on the S Yuba. I wasn't paddling sharp - my timing was off on the boofs, my lines were not spot on - but I focused and made sure I was never far off line and avoided the bad spots. It was the first time I made it down that run without even flipping. Definitely a win. The day before I drove right by the S Yuba with my buddy Matt on our way up to run Pauley and Lavazzola cree ks by the N Yuba. We both were tired and feeling kind of lazy and as we went pass Matt said that as much fun as 49 to Bridgeport is you still need to show it respect. So we had a really fun day running the creeks instead. Lavezzola was just perfect low volume creeking: read and run the whole way with one bigger drop to spice things up. Pauley has more bigger/funner drops but more mank in between. Both were just fun and stress free at this level and it was the perfect call for the day. But Matt's words were echoing in my ears as I put on to 49 the next day and I gave it the respect it deserves and it paid me back with one of the funnest IV/V runs in the state. CCK opened up its new demo center on the river in Coloma and as part of the Grand Opening festivities Team Jackson came to town for a paddle down the SF American Chili Bar run. They pulled up to the Sierra Nevada House in the Jackson RV and met with the eager folks looking to get out on the river with such an impressive family - all current or former world champions: EJ, Dane, Emily and Nick. Better yet, they are all super nice folks who are very approachable and helpful on the river, be it teaching/encouraging people on their first rolls or jumping into the water to get a stuck boat off a rock. We also had local team members Sage Donnelly (9 ye ars old) and Hilde Schweitzer. We had about 35 people join us for some stretch of the river. People were getting some surfing tips at Maya, a grea t playboating exhibition at First Threat, combat rolling tips from EJ, flatwater playboating tips from Nick and Emily, and overall a great day on the river with great people. Personally, I finally got a chance to try the new Jackson Villain. EJ loaned me his personal boat - hopefully he won't notice the extra scratches I put into it seal launching at Maya. I've been paddling the Rocke r for three years and love the boat on low volume steep stuff but it's round hull makes it kind of mushy and harder to control in big water or just cruising down class IV. The Villain seems to have kept the mostly round hull which allows for great stability and ease of paddling through stuff but it has added a little bit of rail to allow the boat to carve and correct easier. The Rocker is a great boat if you stay on top of it, the Villain is a great boat that doesn't need as much minding. And it's fast as hell and ferries like a champ. Definitely placing my order for one right away.